Hall of Isaac will be open to the public on Succot. 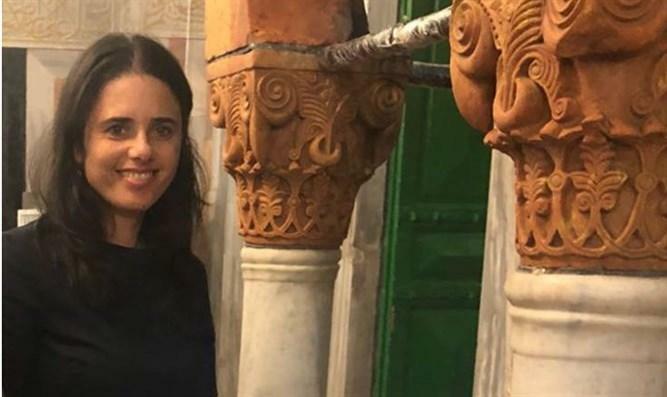 Justice Minister Ayelet Shaked visited the Tomb of Machpela / Cave of the Matriarchs and Patriarchs in order to examine accessibility at the site. The Thursday visit also included her son who recently celebrated his bar mitzvah, and his friends. She gained special access to the Isaac Hall [Olam Yitzchak] which is open to Jews only on Jewish holidays. For over 20 years, the Machpela complex has been divided into separate Jewish and Muslim sections with separate entrances. The Isaac Hall, which contains the memorial markers for Isaac and Rebecca is the largest room in the complex and usually reserved for Muslim prayers services only. The Jewish section contains the memorial markers (also knows and cenotaphs) for Jacob and Leah. The memorial markers for Abraham and Sarah are viable to both sides. Sections that are only accessible to Muslim visitors are Jawliyya Hall, Yusufiyya Hall, including the chamber of Adam's footprint, and Waqf offices. The rotation agreement with the Muslim Waqf allows for ten days a year for exclusive Muslim prayer services and ten days a year for Jewish services, corresponding to Islamic and Jewish holidays. Two of those ten days will be on Succot next week. For more information click here. Because of political and religious sensitivities, repairs and additions to infrastructure has been slow at the holy site. Jewish visitors have been asking for wheelchair accessibility and better roofing for the Jewish sections during the winter rains. Minister Shaked is the latest elected official to voice support for the Jewish community of Hebron and has visited the city many times in the past. Over 700,000 people the Jewish section of the Tomb of Machpela every year.